Focke-Wulf Fw 190A8 Red-2 flown by Norbert Graziadei of 5/JG300 'Moidl' (tyrolean Slang for mother), Lobnitz Germany 1944. 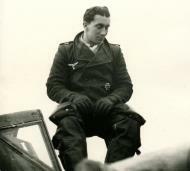 Please find attached photos about Lt. Norbert Graziadei , Pilot of II 5./JG300 and a friend of Schröder and Bretschneider. 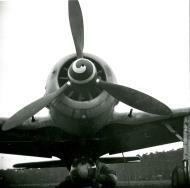 His aircraft was FW190A8/R8. Find also attached his memorandum about himself in the lLftwaffe, bur sorry only in german it has to betranslated into english. Give me INFO, if i can help you to clarify some questions. 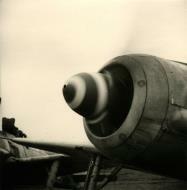 Bretschneider , sorry, died on 24.12.1944 near Kassel, his aircraft was the nicknamed 'Raubautz' and the RED 1. Graziadei's aircraft was a FW190A8/R8 with the NIckname 'Moidl' (tyrolean Slang for mother)and the RED 2.
under the line of Bretschneider. Grazadei has 8 confirmed kills (Americans with 5 kills were Aces !! 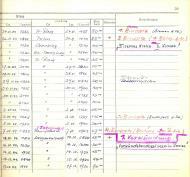 ), and find attached parts of Graziadei's flightbook. A lot of info about Graziadei you will find in this Book Vol2. JG300 frm Lorant. 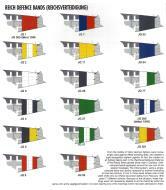 If you need more INFO , dont hasitate to contct me. My 190A-8 template has seen better days and will need an update but I wouldnt mind giving it a go once the template is ready. Are the photos on the site the ones you have received? I might be able to make an approximation of the aircraft from that and will go through Jg300 Vol 2 tonight and see if theres anything more in there. Focke-Wulf Fw 190A8 Red 8 flown by the 19 year old Matthaus Erhard, who flew as Red 1's wingman, The Pimpf motif means youngster, despite his youth he was credited with 7 kills before bailing out with a shattered knee. Fw190A-8/R2, W.Nr. 682641, "Yellow 1, Gloria", flown by 6./JG 300 pilot Fw. 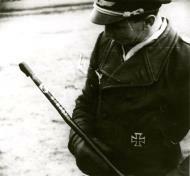 Ewald Preiß in October, 1944 at Löbnitz. Preiss was one of the more experienced members of the unit. By the time he was shot down by P-51 Mustangs on March 24, 1945, flying Fw190A-9 W.Nr. 205279 "Green 3", he had a minimum of six victories over four-engined bombers. Fw 190 A-8/R2 W.Nr 682641 "žlutá 1, Gloria", s níž létal příslušník 6./JG300 Fw. Ewald Preiß v říjnu 1944 z letiště Löbnitz. Preiß patřil mezi zkušené příslušníky jednotky. Do 24.3.1945, kdy byl v cockpitu Fw 190 A-9 W.Nr.205279 "zelená 3", sestřelen v boji se stíhačkami P-51 Mustang, dokázal dosáhnout minimálně 6 vítězství nad čtyřmotorovými bombardéry. 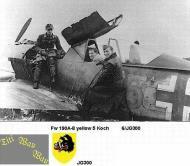 Focke-Wulf Fw 190A8 Karl Spenst, 8./JG 300, December, 1944. Reconstruction of Fw190A-8/R2, "Black 10", flown by CO of 8./JG 300, Karl Spenst, in December, 1944. This aircraft was photographed on November 27th, 1944 at Lobnitz, while still carrying the brick red fuselage band. The identifier for JG 300 was changed to blue/white/blue bands in December, 1944. Our guide pictures the aircraft in this fashion. The emblem of the Berlin Bear on the left side is a personal marking of the pilot. Karl Spenst achieved at least one kill. 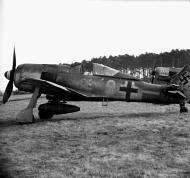 Fw190A-8/R2, "Black 10", flown by CO of 8./JG 300, Karl Spenst, how it was photographed on November 27th, 1944 at Löbnitz, while still carrying the brick red fuselage band, prior the identifier for JG 300 was changed to blue/white/blue bands in December, 1944. Fw 190 A-8/R2 "černá 10", se kterým létal velitel 8./JG 300 Lt. Karl Spenst, jak byl vyfotografovaný 27. listopadu 1944 v Löbnitz, kdy ještě nesl cihlově červený pruh na trupu. Označení JG 300 bylo v prosinci změněno na modro/bílo/modré pruhy. Rekonstrukce podoby stroje Fw 190 A-8/R2 "černá 10", se kterým létal velitel 8./JG 300 Lt. Karl Spenst v prosinci 1944. Tento stroj byl fotograficky zachycen 27. listopadu 1944 v Löbnitz, kdy ještě nesl cihlově červený pruh na trupu. Označení JG 300 bylo v prosinci změněno na modro/bílo/modré pruhy, zobrazené i na tomto bokorysu. Emblém berlínského medvěda na levé straně je osobním označením pilota. Karl Spenst dosáhl minimálně jednoho vítězství. Remarks:KIA 11 September, 1944 during aerial combat near Kassel. Source: John Weal. 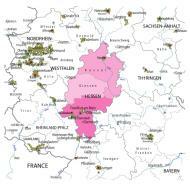 Walter Dahl was born on 27 March 1916 at Lug in the Bergzabern region of Pfalz. He joined the army in 1935, initially serving in the infantry, before transferring to the Luftwaffe and becoming a pilot. He became a flight instructor in 1939. In May 1941, Dahl was transferred to the Geschwaderstab of JG3. He gained his first victory on 22 June during the invasion of Russia. 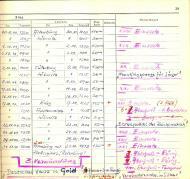 On 10 July, Dahl was transferred to II./JG3. 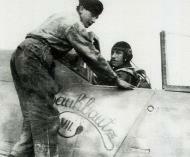 By the end of October, Dahl had 17 victories to his credit, including three Russian aircraft shot down on 13 September to record victories seven through nine and a further three on 23 October, all Russian fighters (15-17). Dahl was transferred to 4./JG3 on 13 December 1941 and accompanied the unit to the Mediterranean theatre. He claimed a Spitfire shot down over Malta on 1 April 1942, although this claim could well have occurred on 2 April. However, the victory was not confirmed and the "Spitfire", actually a RAF Hurricane of 229 Sqn, managed to return to its base on Malta, albeit damaged. On 10 April 1942, Dahl was appointed Staffelkapitan of Erganzungsgruppe/JG3. 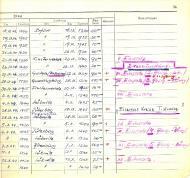 At the end of April 1943, Dahl was transferred to the staff of the General der Jagdflieger. On 15 August, Dahl was appointed Geschwaderadjutant of JG3 based on the Eastern front where, by mid-April 1943, he had raised his victory total to 51. Dahl shot down four Russian Il-2 ground attack aircraft on 26 October 1942 (34-37). 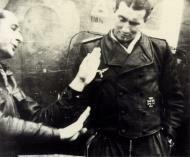 Oberleutnant Dahl was awarded the Deutsches Kreuz in Gold on 2 December 1942 for 42 victories. He shot down two Russian LaGG-3 fighters on 16 April 1943 (50-51). On 20 July 1943, Dahl was posted as Gruppenkommandeur of III./JG3, recently relocated to Munster from deployment around Kursk on the Russian Front. Here Dahl was to battle the bomber formations of the USAAF. He shot down two fourengined bombers on 6 September (52-53). He downed two more four-engined bombers and a USAAF P-38 twinengined fighter on 23 February 1944 (59-61). Dahl led III./JG3 against the Schweinfurt and Regensburg raid on 17 August but was intercepted by 222 Squadron RAF Spitfires. Five III./JG3 Bf-109s were shot down including the aircraft of Leutnant Hans Schleef (99 victories, RK, killed in action 31 December 1944). 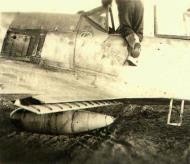 Dahl himself had to make a belly landing near Capperath when his Bf-109G-6 (W.Nr. 18842) suffered an engine failure. Major Dahl was awarded the Ritterkreuz on 11 March 1944 for 67 victories. 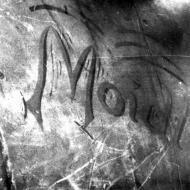 On 21 May 1944, Dahl was appointed Kommodore of JGz.b.V. He led the unit until 6 June before taking command of JG300 on 27 June. On 13 September, he brought down a USAAF B-17 four-engined bomber by ramming. Despite the successes achieved against the USAAF four-engined bombers with the use of Sturm tactics employed by JG300, Dahl was to be relieved of his command by Goring on 30 November 1944. On 26 January 1945, he was appointed Inspekteur der Tagjager. Oberst Dahl was awarded the Eichenlaub on 1 February for 92 victories. Despite his promotion, Dahl continued to fly operationally. He added 32 Russian aircraft to his tally flying over the Eastern front. He recorded his 100th victory on 28 February 1945. 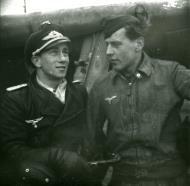 Oberst Dahl ended the war flying Me 262 jet fighters with III./EJG2. Here he flew under the command of Heinz "Pritzl" Bar (221 victories, RK-S). On 27 March, Dahl claimed two USAAF P-47 fighters shot down. He gained his 128th and last victory, a USAAF P-51 Mustang near Dillingen, on 26 April 1945. Walter Dahl survived the war but died on 25 November 1985 at Heidelberg, aged 69. Walter Dahl shot down 128 enemy aircraft in 678 missions, including about 300 ground-attack missions. He claimed 30, possibly 36, four-engined bombers and 34 Il-2 Stormovik ground attack aircraft. Dahl also achieved 2, possibly as many as 9 victories, flying the Me-262. He recorded 84 victories over the Eastern Front. 28-Feb-45 Walter Dahl Stab Insp./derTagjager Abschu? Remarks:On 7 July, 1944, he lost an A-8 at Leipzig, his disposition unknown. A 3rd AC loss, another A-8 on 31 December, 1944 at Rotenburg, unknown if injured. One known victory, a B-24 NW of Tulln on 26 June, 1944. A 2nd, a B-24 SE of Eschwege on 27 September, 1944. A 3rd, a B-17 (HSS) at Hildesheim-Salzgitter on 28 September, 1944. A 4th, a B-17 in the Rathenow area on 6 October, 1944. A 5th, a B-17 (HSS) in the Artern area, W of Leipzig, on 7 October, 1944. A 6th, a B-24 at Prossnitz (Olomouc) on 17 December, 1944. Deceased 1999. Konrad “Pitt” Bauer was born on 9 February 1919 at Gelsenkirchen. 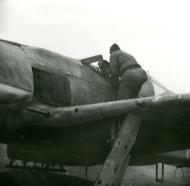 In March 1943, Bauer was serving with JG 51 based on the Eastern Front. 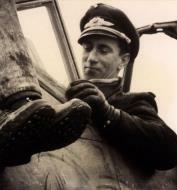 Unteroffizier Bauer was assigned to 10./JG 51. He recorded his first victory on 20 March, when he shot down a Russian Pe-2 twin-engine bomber. 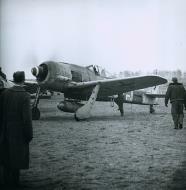 By September 1943, Bauer was serving with the Geschwaderstab of JG 51. On 15 December 1943, he claimed six enemy aircraft, five of which he shot down in five minutes on one mission. He gained a total of 18 victories over the Eastern front. Bauer was transferred to 2./JG 3 “Udet”, operating on Reichsverteidigung duties, in March 1944. He recorded his first victory over a four-engine bomber on 18 April, when he shot down a USAAF B-17. He shot down another two B-17s on 24 May. In June 1944, Bauer was transferred to 5. (Sturm)/JG 300. This unit was mostly equipped with Focke-Wulf 190 A-8/R2 or R8 with two 30mm cannon Mk 108 and two 20mm cannon MG 151/20 to combat the increasing number of USAAF four-engine bombers raiding Germany. With this unit he became one of the best Viermottöters recording 29 four-engine bombers shot down. On 7 July 1944, Bauer shot down two USAAF B-24 four-engine bombers and escorting USAAF P-38 twin-engine fighter in the Oschersleben area. 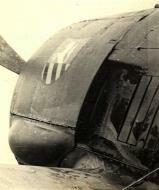 On 11 September, after shooting down three USAAF P-51 fighters, he was himself shot down in Fw 190 A-8 (W.Nr. 681 469) “Red 21” and wounded losing two fingers from his right hand. Feldwebel Bauer was awarded the Ritterkreuz on 31 October 1944 for 34 victories, including 14 four-engine bombers. At the end of January 1945, Bauer returned as Staffelkapitän of 5./JG 300. Bauer was recommended for the Eichenlaub but never received the award. 'Pitt' Bauer flew 416 combat missions and shot down 57 enemy aircraft. He recorded 18 victories over the Eastern front. Of his 39 victories recorded over the Western front, 32 were four-engine bombers including some Herausschüsse and at least five P-51 fighters. He was shot down seven times. Known Aircraft:Fw 190A-7 'Yellow 1N' w Stf., Fw 190A-8/R8 'Red 16' (rammed a B-24 in this a/c. ), Fw 190A-8/R8 WNr 682204 'Red 1' (lost) w/5 Stf. 23-Sep-43 Klaus Bretschneider 5./JG300 4-mot. Flzg. 29-Dec-43 Klaus Bretschneider 5./JG300 4-mot. Flgz. 29-Jan-44 Klaus Bretschneider 5./JG300 4-mot. Flzg. 18-Mar-44 Klaus Bretschneider 5./JG300 4-mot. Flzg. Remarks:WIA 14 January, 1945 after taking B-17 return fire. He suffered a severe knee wound and landed 200 meters from his comrade, Ofhr Kuring, at Löbnitz. He was carried by a horse cart to a hospital in Kyritz, where his left leg was amputated. Five Bombers. He served as Bretschneider's wingman. One known victory, a P-51 at the Eisenach airfield on 11 September, 1944. A 2nd, a B-17 (HSS) at Eberswalde on 12 September, 1944. A 3rd & 4th, a B-17 (HSS) and a B-17 near Rathenow on 6 October, 1944. A 5th, a B-24 at Prossnitz (Olomouc) on 17 December, 1944. Jager Blatt. Alternate spelling: Erhard. Remarks:He flew his first mission on 15 August, 1944. Two of his victims were B-24's of the 445BG, shot down in seconds, 15 km S of Eschwege on 27 September, 1944. This same day, he escaped the guns of a P-51B of 376FS, 361FG, piloted by 2/Lt Robert Volkman after an extended dogfight. A 3rd known victory, earlier, a P-51 SW of Kassel on 11 September, 1944. Belly landed his 'Red 19' on 27 November, 1944 after a wild dogfight with a P-51 over Halberstadt-Quedlingburg. A 4th, a P-51 in the Kassel-Badhersfeld area on 24 December, 1944. His 'Red 19' bore the motto 'Kolle alaaf' (Cologne aloft). Schröder was born in Cologne. The motto inscribed on his 'Red 19' 'Kölle-alaaf' translated, meant Up with Cologne. He was a good friend of Uffz Kurt Witte(KIA). He was known to have landed at the Holzkirchen airfield, which housed an Italian Ju 87 unit, and was caught in the middle of a strafing attack by four P-47's. Alternate spelling; Schroeder (Magnus) & Schroeder. Remarks:POW 27 April, 1945 after being shot down in 'Red 10' in the vicinity of Deggendorf/Plattling. One known victory, a B-24 at Calbe/Saale on 7 July, 1944. His 7 July injuries, if any, unknown. Magnus, 7 victories. Remarks:10+ bombers. On 24 August, 1944, after downing a B-24 at Neuhaus (Jindrichuv Hradec Bohemia), he was shot down with wounds by return fire, in his A-8 'Yellow 7'. Lost a 2nd A-8, Werk # 681181 'Yellow 2', at Hersfeld on 24 December, 1944. Pilot severely wounded a 2nd time. One known victory, his 1st, a Stirling SE of Wüppertal on 31 July, 1943, only hours after being assigned to Stabsstaffel/JG Hermann. Another, a Lancaster S of Nürnburg on 28 August, 1943. A B-17 S of Schönewalde and a B-24 at Luckenwalde on 21 June, 1944. A B-24 SW of Tulln on 26 June, 1944. A B-24 S of Magdeburg on 7 July, 1944. A B-24 (im Zus. - with flak) at Neuhaus/Böhmen on 24 August, 1944. A B-24 SE of Eschwege on 27 September, 1944. A 2nd B-24, same day, in the Treffurt area. A 9th, a B-24 at Prossnitz (Olomouc) on 17 December, 1944. Shot down four times. Survived the war. His victories may be as high as 21; 20 bombers and one Mosquito, per his son Wolfgang Engst. 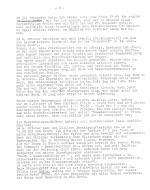 Remarks:KIA 7 October, 1944 during aerial combat near Leipzig (JG-300 Loss List). Two known victories, a B-17 at Eberswalde and a B-17 (HSS), same location, on 12 September, 1944. Another double victory, two B-24's SE of Kassel on 27 September, 1944. A 5th, a B-17 at Hildesheim-Salzgitter on 28 September, 1944. Alternate spelling: Fodisch (Magnus). Remarks:Shot down with wounds 17 December, 1944 at Olomouc, Slezsko, CZ; parachuted safely (JG-300 Loss List). One known victory, a B-24 at Prossnitz on 17 December, 1944. Former EM. Another source suggests the AC was an A-8/R2 'Yellow 12'. Alternate spelling: Lixfeldt. Remarks:5 Bombers. One known victory, a B-17 in the Daun-Kyllberg area on 15 August, 1944. A 2nd & 3rd, a B-24 and a B-24 (e.V.) over Austria on 22 August, 1944. A 4th, a P-51 near the Gotha airfield on 27 September, 1944. A 5th, same day, a B-24 50 km SE of Kassel. A B-17 (HSS) at Rathenow on 6 October, 1944. Magnus, 10 victories. Alternate spelling: Theis. Remarks:24 Bombers (22 four engine). Top Sturmgruppen pilot. 7 victories in the East. Plus 8 unconfirmed in only 66 combat missions! Shot down 9 times. One of the few 'New Growth' pilots to survive the war. Entered combat in January, 1944. His first aerial victory was on 6 March, 1944, a B-17(HSS), no location, the day Uncle Ralph Kracker was shot down. A double victory on 8 March, 1944; nos. 2 & 3, both B-17's (HSS) , no locations. His 5th, a B-24 (HSS) on 9 April, 1944, no location. His 10th, a B-24 (HSS) S of Sülze-Südheide on 8 May, 1944. A B-24 N of Quedinbürg on 7 July, 1944. A P-51 at Mürzzuschlag on 23 August, 1944. A B-17 at Brünn on 29 August, 1944. His 35th & 36th victories, both Yak-9's S of Berlin on 24 April, 1945. His 37th, a Yak-9 at Berlin on 25 April, 1945. His 38th, and last victory, a Yak-9 at Berlin on 30 April, 1945. Deceased 27 October, 2004. Remarks:KIA 24 March, 1945 in his AT at Göttingen. Two known victories, both B-24's, one in the Mor (Krs Fejer) area, the other S of Martonvasar, SW of Budapest, on 27 July, 1944. A 3rd, a B-24 50 km SE of Kassel on 27 September, 1944. A 4th & 5th, a B-17 at Querfurt, W of Merseburg, and a P-51 in the Artern area, W of Leipzig, on 7 October, 1944. A 6th, a B-24 at Prossnitz-Kremsier on 17 December, 1944. Alternate spelling: Preis. Walter Loos was born on 11 April 1923 at Oppenheim in Rheinhessen. Following flying training he was sent to III./JG 3 in January 1944. He claimed his first aerial victory in the big aerial battle over Berlin on 6 March 1944 claiming a USAAF B-17 Herausschuss. Later he was transferred to IV. Sturmgruppe/JG 3. When Oberst Walter Dahl (129 victories, RK-EL) became Kommodore of JG 300 in July 1944, Loos joined with him to serve on the Geschwaderstab. On 29 September, Loos was awarded the Deutsches Kreuz in Gold. Loos was posted to undertake instructing duties with Ergänzungs-Jagdgruppe Ost in October 1944. 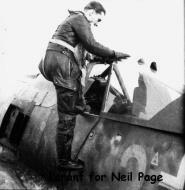 He returned to combat duty with JG 301 where he was assigned to the Geschwaderstab. With this unit he flew the Focke-Wulf Ta 152 for the first time at Soltau-Hannover. He gained several successes over Russian fighters around Berlin flying the Ta-152 in the dying days of the war. On 20 April 1945, Walter Loos was awarded the Ritterkreuz for 36 victories. Walter Loos flew 66 combat missions to achieve 38 confirmed victories and 8 unconfirmed. 30 enemy aircraft were claimed on the Western Front, 22 of them four-engined bombers. He himself was shot down nine times. Remarks:His first mission was over Warsaw in an Bf 109F in SG-2. Two known victories, Both B-24's 50 km SE of Kassel on 27 September, 1944. A 3rd, a B-17 at Rathenow on 6 October, 1944. Seven of his victories were unconfirmed. JG-300 website says his only award is the EK 2, despite having 7 victories! Remarks:One known victory, a P-51 at Kassel-Bad Hersfeld on 24 December, 1944. Known to have crashed his D-9 in a forest near the Löbnitz airfield due to lack of fuel. Remarks:WIA 24 December, 1944, he lost his A-8 at Ziegenhain, near Lobnitz (JG-300 Loss List). One known victory, a P-51 SE of Kassel on 24 December, 1944, the same day he lost his A-8. Remarks:One known victory, his 1st, a B-17 5 km SSE of Kritwitz on 30 May, 1944. A 2nd, another B-17 on 14 January, 1945.